Every year, severe weather endangers millions of people and causes billions of dollars in damage worldwide. But new research from Penn State's College of Information Sciences and Technology (IST) and AccuWeather has found a way to better predict some of these threats by harnessing the power of big data. The research team, led by doctoral student Mohammad Mahdi Kamani and including IST professor James Wang, doctoral student Farshid Farhat, and AccuWeather forensic meteorologist Stephen Wistar, has developed a new approach for identifying bow echoes in radar images, a phenomenon associated with fierce and violent winds. "It was inevitable for meteorology to combine big data, computer vision, and data mining algorithms to seek faster, more robust and accurate results," Kamani said. Their research paper, "Skeleton Matching with Applications in Severe Weather Detection," was published in the journal of Applied Soft Computing and was funded by the National Science Foundation (NSF). "I think computer-based methods can provide a third eye to the meteorologists, helping them look at things they don't have the time or energy for," Wang said. In the case of bow echoes, this automatic detection would be vital to earlier recognition of severe weather, saving lives and resources. Wistar, the meteorological authority on the project, explained, "In a line of thunderstorms, a bow echo is one part that moves faster than the other." As the name suggests, once the weather conditions have fully formed, it resembles the shape of a bow. "It can get really exaggerated," he said. "It's important because that's where you are likely to get serious damage, where trees will come down and roofs get blown off." But currently, when the conditions are just beginning to form, it can be easy for forecasters to overlook. "Once it gets to the blatantly obvious point, (a bow echo) jumps out to a meteorologist," he said. "But on an active weather day? They may not notice it's just starting to bow." To combat this, the research focused on automating the detection of bow echoes. By drawing on the vast historical data collected by the National Oceanic and Atmosphere Administration (NOAA), bow echoes can be automatically identified the instant they begin to form. Wang said, "That's our project's fundamental goal—to provide assistance to the meteorologist so they can make decisions quicker and with better accuracy." 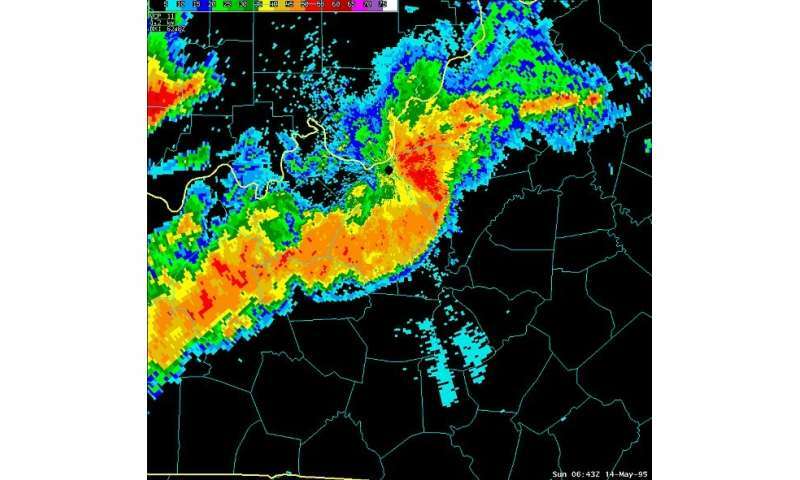 By continually monitoring radar imagery from NOAA, the algorithm is able to scan the entire United States and provide alerts whenever and wherever a bow echo is beginning. During times of active severe weather, when resources are likely to be spread thin, it's able to provide instant notifications of the development. "But this is just the first step," Kamani commented. With the detection algorithm in place, they hope to one day forecast bow echoes before they even form. "The end goal is to have more time to alert people to evacuate or be ready for the straight line winds." With faster, more precise forecasts, the potential impacts can be significant. "If you can get even a 10, 15 minute jump and get a warning out earlier pinned down to a certain location instead of entire counties, that's a huge benefit," Wistar said. "That could be a real jump for meteorologists if it's possible. It's really exciting to see this progress." Envisioning the future of meteorology, the researchers see endless potential for the application of big data. "There's so much we can do," Wang said. "If we can predict severe thunderstorms better, we can save lives every year."